Extreme kayaking in the Bahamas: Fishermen compete in the Grand Bahama fishing tournament . Christopher Ludgate photos. The sun was just starting to rise, revealing the threat of distant storm clouds glowing with pinks, yellows, and blues above the turquoise horizon. Joe Hector, the Tournament Director. 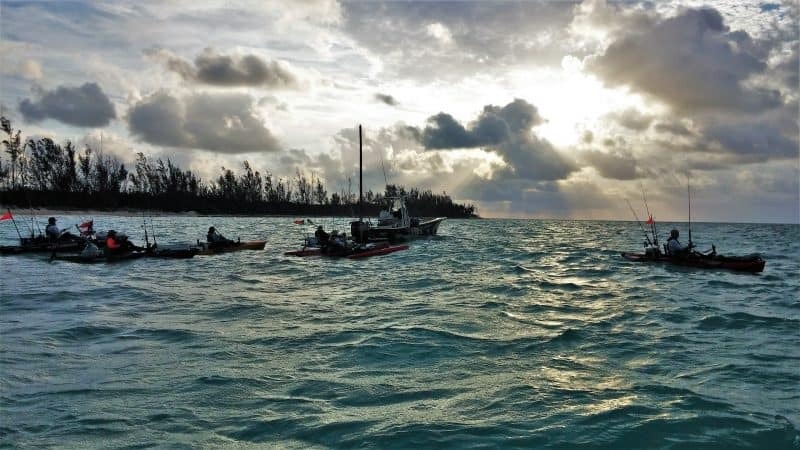 Along the warm, white, sandy coast of Taino Beach on Grand Bahama Island, I stood in a grass hut watching the silhouettes of the competitors of the three-day-long Extreme Kayak Tournament who were prepping their vessels unperturbed by the increasing swells of the water before them. These daring anglers who descended on the island hell-bent on embarking on the annual challenge to kayak miles out into the Atlantic were on a mission in search of claiming the biggest catch - and a big check. While the event feeds the competitive appetite of the anglers, EKFT winds up also “benefiting Bahamas Children's Home,” Joe Hector, the international event director, told me. The home provides quality care to children with special healthcare needs. Some of the fish is donated to kitchens as well another local informed me. 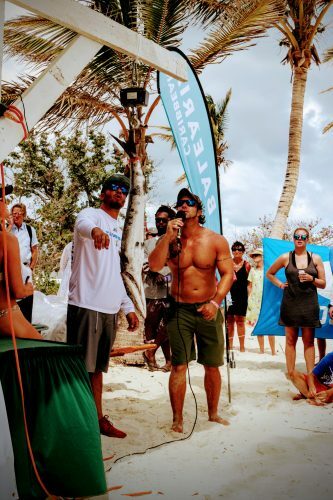 The sun shone through, and the storm threat passed, leaving swells as high as eight feet rolling in the distance while Joe paced the beach, pumping up the spirit of the sportsmen and women with his bullhorn. Full speed ahead, our captain pulled through the mouth of the canal into the Atlantic Ocean’s tides in our little engine that could, as we cheered on the pack of about 40 kayakers furthering on into the thick of it, tackling those big swells with surprising ease. The bow of our boat rocked and hoisted, crashing, again and again, face forward and then sharp down at the stern. Soaked and wind-blown, vest-less, and holding on to our seats tight we watched as the kayakers braved on. The boiling hole is famous on Grand Bahama. And in the midst of the intense ride, what dawned on me was the evident allure and attraction for these anglers as they navigated the rough coast, entering into the calm - into the beauty, peace, and the solitude of their experience. It was then I felt awe-inspired to be part of it. Pure Adrenaline, Hold on Tight! Chivvaun Smith of the local tourism board. Piggy-backing on the adrenaline filled experience, I headed for more thrills at water-sport experts, Ocean Motion, where I booked some time on a Waverunner. 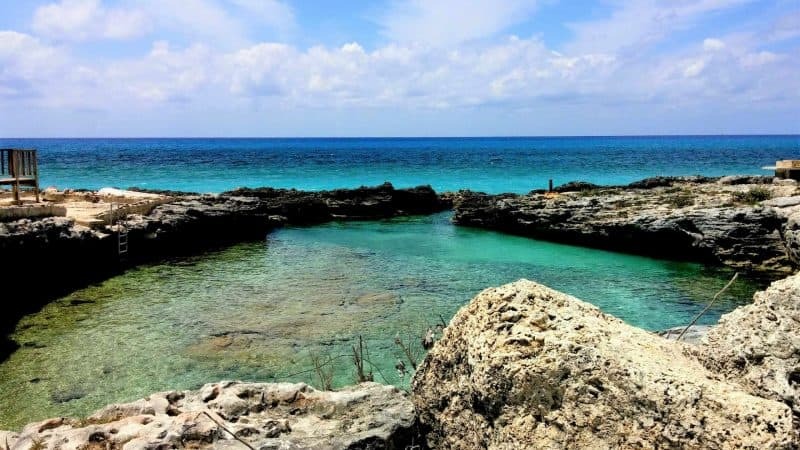 As part of the greater Bahamian archipelago of 800+ islands, Grand Bahama Island - so named by the Spanish for its “great low-tides” - also has many canals running throughout which make for some great adventure via sight-seeing on a Waverunner. Friendly native to the area and Ocean Motion Waverunner pro, Mika, and I tightly strapped on our vests, while I silently questioned entering the still very jerky tide of the ocean. He read my mind and agreed that it was a bit of a rough sea for most people. But I was game and signed my release. The author with his watercraft. With little anxiety over whether that was a question or a command, I harnessed that beast and pressed the accelerator switch until a heady climax, leaning into it feeling wildly free and bursting gleefully before gearing left into the gentle wake of the canals where we saw a whole new side of the hidden scenic marinas, eatery exteriors, and manicured resorts through the Bell Channel. It’s an exhilarating highlight for any Caribbean travel-therapy getaway. Hotel on the Grand Lucyan Waterway boasts colorful and unique Scandinavian-esque architecture and interiors with private terraces looming above its glorious bay and three pools to chill out by, bars to chill out by, an eclectic and savory four-star restaurant, Sabor, whose chefs cater to every diet and whim. Discreet paths are very closely accessible to a plaza of local touristy knick-knack shops. Local Bahamas food at Bojangles in Grand Bahama. Some above-the-grade restaurants like The Grill - a rustic fusion Euro-esque seafood place with an unpretentious, friendly, yet high-end flair with similar ambiance stands out from the usual local places in the area. It is a comfortable stroll from the hotel overlooking the marina. Along an open-air market, is Bojangles, which is impressively manned by co-owner Kephee Bain, who juggles huge and diverse crowds come midday. It may not look like much, but it's definitively local fare and friendly service is very good by measure of patrons. Bain will even take a coconut to the chopping block for you to serve up some fresh hydrating coconut water while waiting on your fresh well-portioned meal. 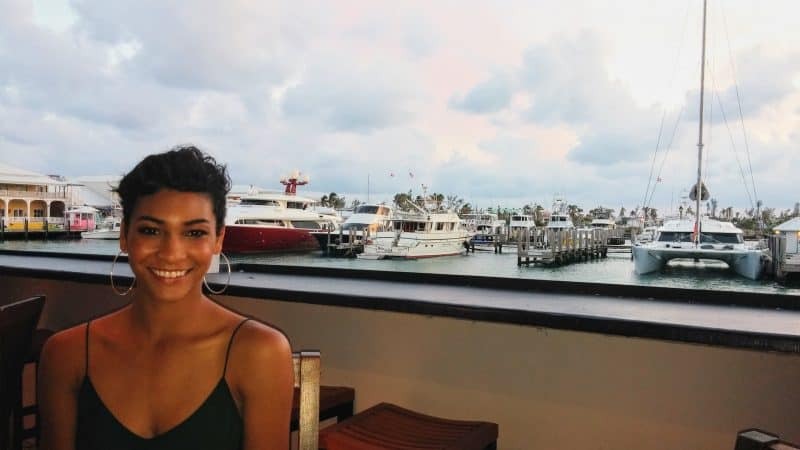 Also notable and on the other side of the bay is Bell Channel Inn which focuses on traditional and modern cuisine, as well as twisting those ideas into accommodating diverse diets with outstanding service by a Bahamian/Dutch family owned business. 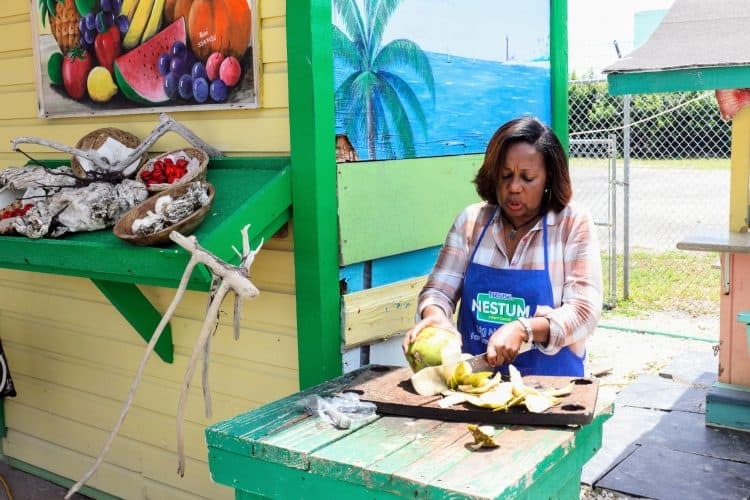 Coconuts are always on the menu in the Bahamas. Bell Channel overlooks Upstairs, a thriving nightclub with live music and a bar that caters from the simple to the traditional local cocktail culture like Sky Juice or a shot of Nassau Royale, like my sweet friend Brook and I sipped on as the band warmed up. Shamie and Va’Doyle from Calabash Eco Adventures picked me and my friend Brook up from the hotel early one morning in their Scooby-Doo-esque tour van. Passing the dirt roads that our guide informed were prepped for city planning in the somewhat barren industrial port, we headed for our kayak Eco-tour as Shamie narrated an off-the-cuff primer to the area’s salient ecosystem. Exploring the skirts of the Pine Forest that Shamie explained, “naturally smolders, but adapted to also extinguish its fire with its own yellow resins, delivering nutrients to the soil” and on to the Blackland and Whiteland coppices - to the Sand Strand of the famous Beaches with their purple spider-lilies, then over to the Dover Sound Mangrove Swashland where the songbirds nest, it proved a more personal hands-on way to experience the Bahamas than rum cocktails, tanning, and Atlantis. Fun as they may be, taking in the natural environment of the young 10,000-year-old islands lends a certain appreciation. And it’s beautiful. After applying a good coat of bug spray just in case, we hopped in our double Kayaks with a small group who joined in on the eco-tour of the Mangrove. Shamie lead the way into the graceful remote waterway. The soothing effect of rhythmic gliding along the surface of the placid water relaxed my mind. We respectfully scoped out indigenous birds and baby Heron’s and Egret’s in their nests, exploring a balanced and stunning nature, allowing a spiritual rejuvenation from the tedious clutter that sometimes distracts my own inner peace. It was majestic and delightful. Shamie later introduced us to “Da Boiling Hole” for an intimate and eye-catching snorkeling experience; another of the many visual hands-on informative and personal chauffeured aquatic tours he offers that get you up close and personal with one of the world’s fascinating ecosystems. The workings of the Bahamian Brewery. In the afternoon, Brook and I took a detour to The Bahamian Brewery for some more intrigue after learning that it existed as a sponsor of the Extreme Kayaking event. We earned a brew after the paddling. “We opened in 2007 and expanded now four times since. The brewery does not yet export out of the country, but there are some discussions happening - unofficially,” Chrissy Hanna teased while at the tasting bar. “Maybe that’s part of the new expansion,” Hanna elaborated. We sampled some of the brews whose main ingredients are imported from Germany. Highlights were High Rock with its golden creaminess, Virgil’s 6% alc Amber Ale, which is exclusively made for Nassau’s Atlantis Resort, and the popular Bush Crack which has a hilarious back story that Hanna illustrated for us adding some unabashed humor to some unexpected levity on the journey. And it’s worth a taste, too!